RIO DE JANEIRO — More than a million Brazilians poured into the streets of at least 80 cities Thursday in this week’s largest anti-government demonstrations yet, protests that saw violent clashes break out in several cities as people demanding improved public services and an end to corruption faced tear gas, pepper spray and rubber bullets. In Rio de Janeiro, where an estimated 300,000 demonstrators swarmed into the seaside city’s central area, running clashes played out between riot police and clusters of mostly young men, their T-shirts wrapped around their faces. But several peaceful protesters were up in the crackdown, too, as police fired tear gas canisters into their midst and at times indiscriminately used pepper spray. Thundering booms echoed off stately colonial buildings as rubber bullets and the gas were fired at fleeing crowds. At least 40 people were injured in Rio, including protesters like Michele Menezes, a wisp of a woman whose youthful face and braces belie her 26 years. She said that she and others took refuge from the violence in an open bar, only to have a police officer toss a tear gas canister inside. It exploded on top of Menezes, tore through her jeans and dug out two quarter-sized holes on the back of her thighs while also perforating a rash of small holes in her upper arm. “I was leaving a peaceful protest and it’s not the thugs that attack me but the police themselves,” said Menezes, removing her wire-rim glasses to wipe her bloodshot eyes. She later took refuge in a hotel along with about two dozen youths, families and others said they had been repeatedly hit with pepper spray by motorcycle police as they too took refuge inside a bar. Despite the crackdown, protesters said they would not back down. “I saw some pretty scary things, but they’re not going to shake me. There’s another march on the 22nd and I’m going to be there,” said 19-year-old university student Fernanda Szuster. In Brasilia, police struggled to keep hundreds of protesters from invading the Foreign Ministry, outside of which protesters lit a small fire. Other government buildings were attacked around the capital’s central esplanade. There, too, police resorted to tear gas and rubber bullets in attempts to scatter the crowds. Clashes were also reported in the Amazon jungle city of Belem, in Porto Alegre in the south, in the university town Campinas north of Sao Paulo and in the northeastern Brazilian city of Salvador. The protests took place one week after a violent police crackdown on a much smaller protests in Sao Paulo galvanized Brazilians to take to the streets. The unrest is hitting the nation as it hosts the Confederations Cup football tournament with tens of thousands of foreign visitors in attendance. It also comes one month before Pope Francis is scheduled to visit the nation, and ahead of the 2014 World Cup and 2016 Olympics, raising concerns about how Brazilian officials will provide security. Mass protests are rare in this 190 million-person country, with demonstrations generally attracting small numbers of politicized participants. The ongoing, growing marches have caught Brazilian governments by surprise, but have delighted many citizens. “I think we desperately need this, that we’ve been needing this for a very, very long time,” said Paulo Roberto Rodrigues da Cunha, a 63-year-old clothing store salesman in Rio. In Salvador, police shot tear gas canisters and rubber bullets to disperse a small crowd of protesters trying to break through a police barrier blocking one of the city’s streets. One woman was injured in her foot. Elsewhere in Salvador some 5,000 protesters gathered in Campo Grand Square. “We pay a lot of money in taxes, for electricity, for services, and we want to know where that money is,” said Italo Santos, a 25-year old student as he walked with friends toward the square. Despite the energy on the street, many protesters said they were unsure how the movement would win real political concessions. People in the protests have held up signs asking for everything from education reforms to free bus fare while denouncing the billions of public dollars spent on stadiums in advance of the World Cup and the Olympics. 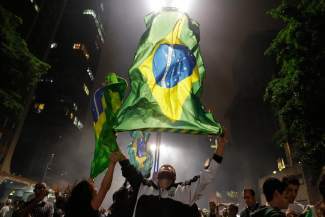 Earlier Thursday, the protests took on the feel of a party, especially in Sao Paulo and Rio. People of all ages, many of them draped in flags, gathered in front of the majestic domed Candelaria church in downtown Rio, while groups elsewhere pounded out Carnival rhythms or chanted slogans targeting Rio state’s governor. At one point, a police helicopter flew over the crowd, which booed and pointed green lasers at the craft. But as has been the pattern earlier this week, the clashes began once night fell. Several city leaders have already accepted protester demands to revoke an increase in bus and subway fares in the hopes that anti-government anger cools. In Sao Paulo, where demonstrators blocked Paulista Avenue, organizers said they would turn their demonstration into a party celebrating the lower transit fares. But many believe the protests are no longer just about bus fares and have become larger cries for systemic changes. President Dilma Rousseff called an emergency meeting with top advisers for Friday morning. Rousseff has been largely absent since the demonstrations broke out, making just one public statement but offering no speeches or grand gestures in an attempt to calm the situation.